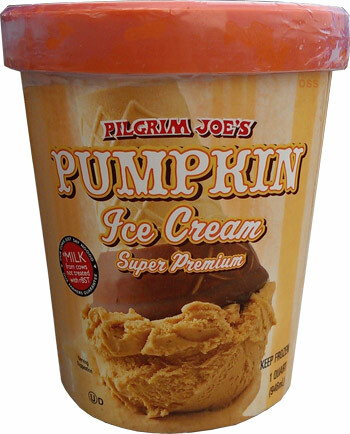 Or should I say Pilgrim Joe's Pumpkin Ice Cream? It comes out once a year and despite an overload of pumpkin products this year, I'm going to give this super premium ice cream a shot. 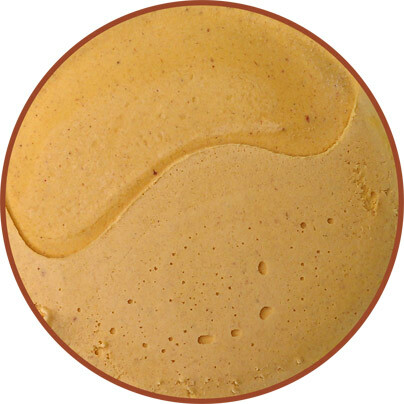 "Made with nearly 30% pumpkin puree"
It's a rich orange color that hopefully you can see. Yeah, it's strong, but not so much as to bowl me over like that Frozen Pumpkin Pie drink from Einstein Bros. Instead, this one maintains some decorum of a frozen treat. My favorite part is the melting edges because it reminds me of a pumpkin shake. That reminds me, this is definitely stronger than a pumpkin blizzard. I like the description of "blend of warm, seasonal spices" because to be honest, there is that little bit of heat in the flavoring here. There are so many ways to do nutmeg, cinnamon, ginger and "a hint" of cloves, and to give it that little bit of edge is neat for an ice cream. It's not my usual style, but I like the change up. Now, do I like it? Yes. Do I love it? It's harder to say yes here because I've been spoiled by so many crust bits and marshmallow swirls from other brands. Some people scoop the pumpkin pie out of the crust, but me, I want that crust/pie balance to seal the deal. This one is well done, I'm just not in love.... says the person who just scooped several more bites. Nice job Trader Joe's. On Second Scoop: I thought I'd be a smarty pants and smash a few of these tasty trader joe's dark chocolate peanut butter cups into my pumpkin ice cream because I kept thinking dark chocolate chips might go nicely here. Well... the spices are totally overriding the chocolate (and peanut butter for that matter). Oh well. I'm still amazed at how bespeckled by spices this flavor is. I wish I knew my spices better so I could tell you which one is sticking out so much... must be the nutmeg right? It's definitely not the cinnamon. 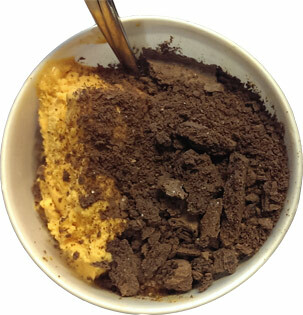 On Third Scoop: I tried cutting the ice cream with chocolate graham cracker bits this time... but it's still quite potent... but this mix does make me want a pumpkin Oreo blizzard. This is a nice ice cream, but I enjoyed it more as a one time snack more than as a daily snack, it's just a bit more powerful than I prefer.... I still need to make a shake with it. I love it! If I had molasses I would make some chewy ginger cookies and make a ginger pumpkin ice cream sandwich. Nice! Big thick cookies so it can balance out the strong flavor! You should review more Trader Joe's products. 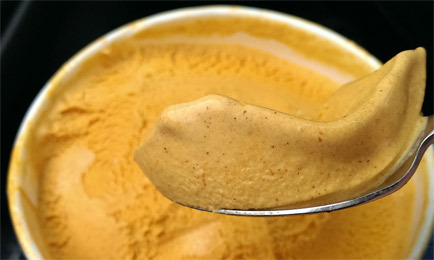 Fav Pumpkin Ice Cream. Was hoping you would review this last year. Glad you did this year. Just boughjt this last weekend and it was gone in 4 days. Will definitely buy more on the way home today,. I think its wonderfully decadent.. I like the flavor burst - and it can hold up to caramel sauce.. or bourbon or rum. I love it! The only thing wrong with it, comes out only once a year. I do enjoy the bold pumpkin spice. I'm the holiday pumpkin pie maker and push the spices a bit, as well. I am very, very picky about pumpkin flavored products. This is the first I've loved. Bought it on a road trip. By the time I was to Fresno, stirred it up and actually had an amazing pumpkin shake. It's hard to go by a person reviewing's sense of what's what. When the suggestion was made to add or top with other constructions, I knew there was a difference in taste. For my liking, add nothing. The load of actual pumpkin made me so very happy! Pumpkin perfection.